Nurse managers exist in two worlds: They’re simultaneously staff and management, very often working alongside the same nurses they oversee. That, like a lot of aspects of nursing management, can be challenging. 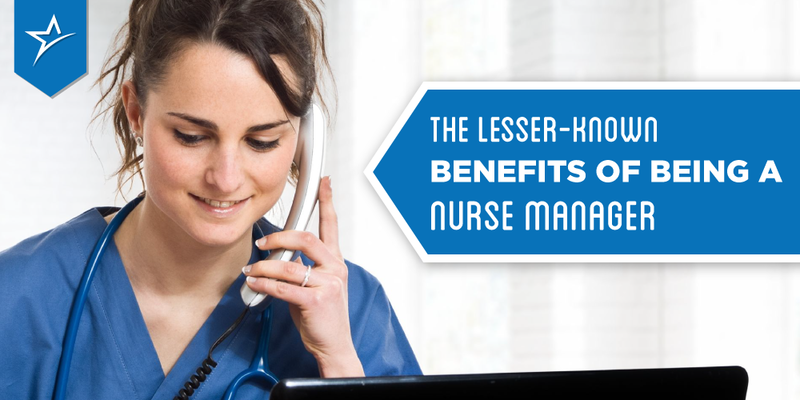 As nurses ourselves, we know working as a nurse manager can also be rewarding and fulfilling, so if management is one of the reasons you’re considering earning your BSN degree, you should know the lesser-known benefits of the job. In every job and industry, people like to be challenged. The human brain is the most complex object in the known universe, and so it’s often most fulfilled doing work that requires ingenuity and new experiences. RNs who have worked in the same unit of the same hospital for a decade will have seen changes in technology and policies, and certainly different patients every day, but the work can feel routine after awhile. Nurse managers do have more responsibilities than most shift nurses, which is as much a benefit as it is a cost. If you’re craving a change of pace in your work, you don’t have to find a new career, or even a new hospital. Being a nurse manager will offer new, exciting challenges in your work as a nurse. Because they lead whole nursing units, nurse managers often have more (or total) control over their shift schedules, or at least over their time while they’re on their shifts. Being a nurse manager, you lead your team, rather than be led by another manager. For RNs who have years of experience and knowledge, who know what works and why, this autonomy can be tremendously refreshing. With a BSN education to back it up, a managerial position offers you more authority to put your wisdom and talents to their full use. As state legislatures continue to consider ‘BSN in 10’ laws, many hospitals have already taken the matter into their own hands and required their nursing staff to earn their BSN degrees. One of the reasons: They want their full staff to be eligible for managerial positions. Registered nurses are (and always will be) needed everywhere, but in many places there is a particular need for more nurse managers. Healthcare is changing rapidly, and good, experienced management is essential to implementing the changes every hospital and clinic faces. If you’re already a nurse manager, you’ll be even more essential to your workplace. It’s no surprise to any nurse that the industry is changing. The Institute of Medicine predicted a growing need for primary care physicians in its Future of Nursing Report, and like many others it looked to nurses to fill these roles. For decades, nurses have been the backbone of the healthcare system, but they’re poised to become even more prominent as their roles adapt and grow. Being a nurse manager you’ll work at the forefront of this change, helping issue it in. You’ll have more power and authority to implement the ideas and vision that you see for nursing, and you’ll feel a greater sense of fulfillment and achievement as your work, and the work of your team, contributes to the future of nursing. If being a nurse manager appeals to you, we at Ameritech College of Healthcare want to support this new journey in your career. Before you become a nurse manager, you need your BSN, and we’re proud to teach an online degree completion program designed for busy, working nurses. To learn more about earning your BSN online, read about our BSN program. Then reach out and contact us for more information or if you have any questions. We’d love to hear from you!